Mr. Johnson received his B.A. degree from Louisiana State University in 1991 and his J.D. degree from Loyola University in 1994. Since 1994, he has practiced almost exclusively in the fields of insurance defense litigation and workers’ compensation defense. Mr. Johnson was a partner in Noah, Smith & Johnson until its merger with Hammonds & Sills in January 2010. 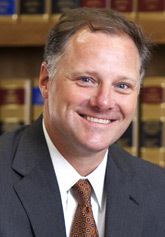 He is a member of the Fourth Judicial District Bar Association and Louisiana State Bar Association. Mr. Johnson is a resident partner in the Monroe office.